There are times when I am astonished that the press doesn't pick up on a particular story. For example: according to activists on Facebook, Chris Christie is having a private meeting tomorrow, June 30, 2016, at Paterson Charter School for Science and Technology. If this is the case, it will be the third time since this spring that Chris Christie has visited a charter school linked to the controversial Muslim cleric Fethullah Gulen, a Turkish expatriate living in seclusion in the United States. On May 16, Christie visited Thomas Edison EnergySmart Charter School in Franklin. Two days later, he trekked to Bergen Arts & Sciences Charter School in Hackensack. Thomas Edison, Bergen A&S, and Paterson Science & Tech have all been linked by the Gulen Charter Schools website to the Gulenist movement in the US. As I've written previously, the proliferation of Gulenist charter schools is not some wild-eyed conspiracy theory: it's been reported on by CBS News, The Atlantic, The New York Times, and The Wall St. Journal. These schools, all linked to Gulen's movement, have been popping up all over the country and are the subject of concerns expressed by the federal State Department due to their use of H1B visas to admit Turkish nationals into the US. Given how closely tied Christie is to Donald Trump -- who wants a ban on Muslims entering the country (although even he doesn't seem to understand his own plan) -- I can't understand why no one in the state press has pursued this story. Why is Christie praising so many Gulen-linked charters? Why is he visiting so many of them? In some states, such as Texas, charter schools led by Turkish immigrants have caused controversy, with critics claiming the schools were used to bring in teachers from Turkey and give contracts to Turkish businesses without fair bidding. In June, The New York Times ran a lengthy examination of these schools, citing some researchers' findings that many were inspired by the views of Fethullah Gulen, a Muslim preacher. 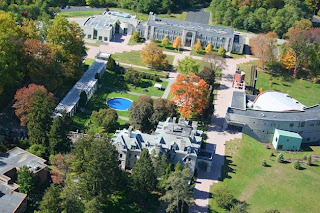 Gulen, who lives in the Pocono Mountains, has promoted peaceful dialogue and tolerance but had critics who feared his influence in Turkish government. Guvercin said he admires Gulen — just as he admires Gandhi — but his teachers never talk in class about Gulen's philosophy. He stressed that charter opponents should visit before forming opinions. "Some people are not comfortable with any ethnic backgrounds," he said. Sorry, but that's way too easy. The concern over Gulen-linked charters isn't about staff ethnicities or creeds; it's about transparency. The Ohio press has reported on Gulen-linked charters' use of H1B visas to import Turkish nationals as teachers. In 2011, the NY Times investigated how Gulen-linked charters in Texas made deals with Gulen-linked contractors. The Turkish government (admittedly, hardly an impartial party) recently filed a complaint in Texas related to this investigation. New Jersey taxpayers have every right to know whether there are similar issues with the Gulen-linked charters in this state. 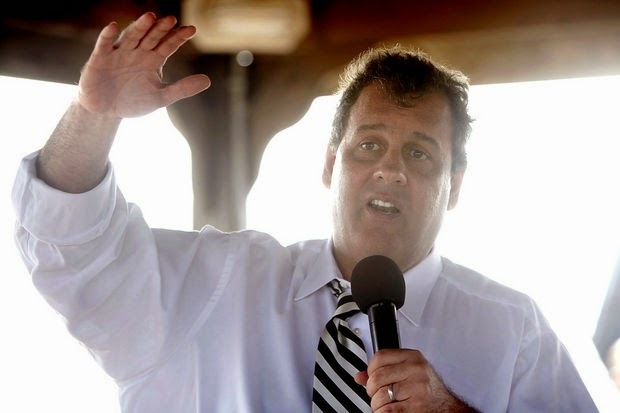 Chris Christie recently proposed a radical transformation of the state's school aid system. Under his plan, aid would be slashed for urban districts -- but, supposedly, not for charter schools. If charters are going to get more state funding than their host districts, that's all the more reason to start asking how that money is being spent. 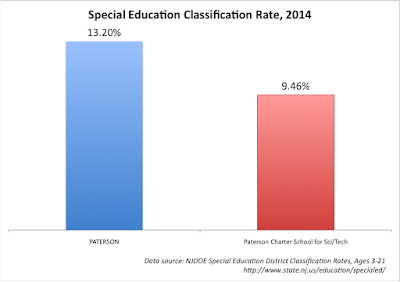 The Paterson Public Schools enroll more students proportionally with a special education need than PCSST. Notice, in the spending graph, that PPS spends about $3,300 per pupil on support services: the services that are especially critical for special needs students. The charter, however, spends nothing on those services according to this data. 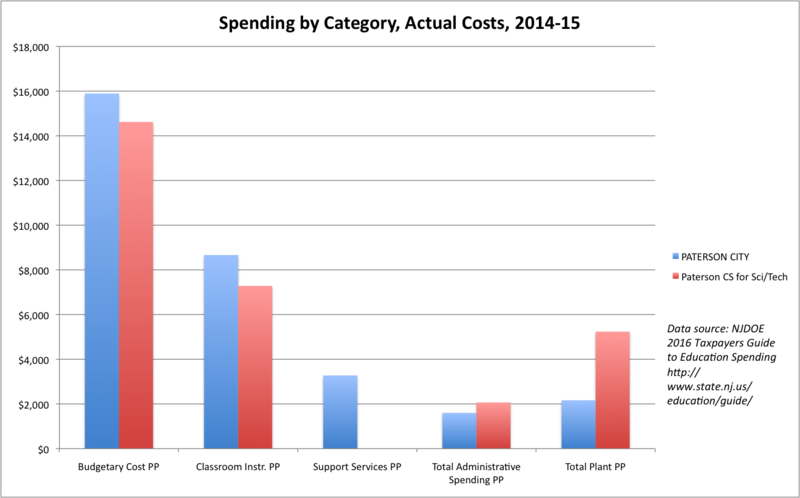 Instead, they spend more on administration, and much more on their physical plant. Where is that money going? The Gulen Charter Schools website has a detailed description of the byzantine financial transactions involved in the leases PCSST pays to Apple Educational Services, and how New Jersey Economic Development Authority Charter School Revenue Bonds were used to finance the deal. Apple ES is a foreign non-profit corporation registered in New Jersey. According to its 2014 tax forms (obtained at Guidestar.org), Apple ES controls $36 million in net assets, but also has $34 million in liabilities, primarily bonds issued by the NJEDA. It also pays out $738 thousand in compensation to its staff. This sort of behavior is quite typical for the charter sector: taxpayer-backed bonds are being used to acquire property that is transferred to private, albeit non-profit, hands,and the bonds are paid off with public funds collected by charters from their host districts. The only way this works, of course, is for the charters to keep expenses low enough to divert enough funds into their lease payments. How does PCSST do this? PCSST staff are actually paid slightly more than PPS staff when accounting for experience. 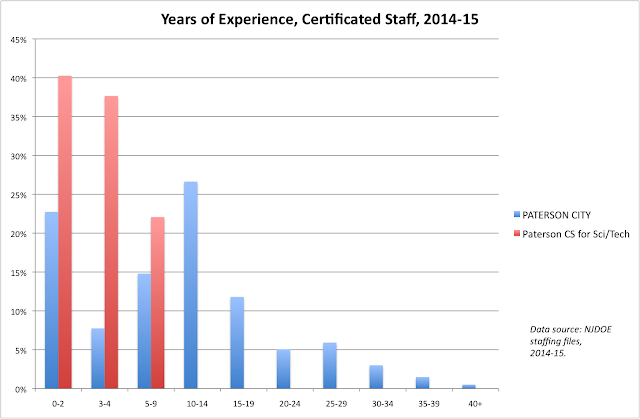 But there isn't even one PCSST staff member with more than 10 years of experience according to staffing files -- and that keeps overall staff expenses low. The money can then be diverted into lease payments. Of course, the evidence continues to pile up that teaching experience matters, even in the later part of a teacher's career. PCSST's students are being denied the benefits of an experienced faculty, but there appears to be plenty of money for bond payments. Now, all this might be acceptable if PCSST was getting far superior results. But when you account for different student populations as I do here*, it turns out the charter is doing OK -- but not much better than that (click to enlarge). 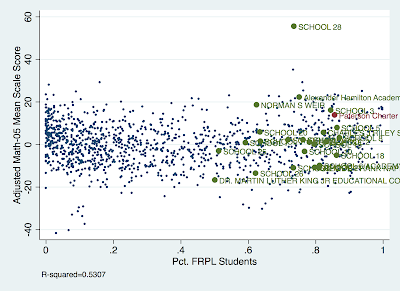 Compared to PPS, PCSST does relatively well on Adjusted Grade 5 math -- but it's not at the top of the pack. PCSST's Algebra 1 scores are relatively weak. PCSST does fairly well on adjusted Grade 6 English Language Arts scores. Grade 10 ELA is average. PCSST is, undoubtedly, full of hard-working, talented students and dedicated teachers. I congratulate them on their successes, but let's be clear: Paterson Charter School for Science and Technology is not far and above the Paterson Public Schools in terms of its test-based outcomes. Why, then, should should PCSST be exempt from Chris Christie's budget slashing tax plan, but Paterson's public schools -- which serve more special needs and Limited English Proficient students -- have to suffer? Especially since there is so much about PCSST's governance and funding that we simply do not know? I wish someone in the NJ press corps cared enough to ask these rather basic questions. PATERSON – The city school district is in the process of making as much as $20 million in last-minute spending cuts in its 2016-2017 budget, a belt-tightening that comes on the heels of $45 million in reductions made several months ago. Paterson Press reported two weeks ago that the district would have to make millions of dollars in extra cuts, but at that time officials had not disclosed exactly how much spending would have to be trimmed. Board of Education President Christopher Irving said state-appointed schools superintendent Donnie Evans informed him that between $15 million and $20 million must be trimmed from the district’s $468 million budget that takes effect on July 1. An extra $20 million in cuts would amount to about 4.2 percent of the budget. What kind of "choice" is that? Free lunch and LEP are from 2016; there are some clearly misreported 2015 demographic figures for PPS, so I opted for more recent figures but matched them with 2015 test scores. Special education is a three-year average from 2012 to 2014. 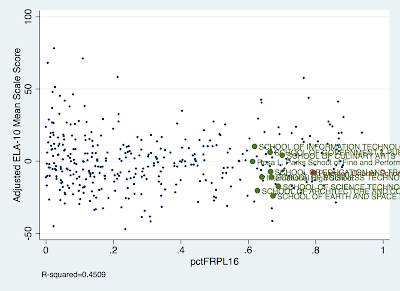 FL and SpecEd are significant at the p < 0.01 level. LEP significance varies; I decided to keep it in all models for consistency's sake. Robust standard errors (N is between 1215 (Grade 5 Math) and 393 (Grade 9 ELA)) with typical colinearity checks (VIFs). The Illogic and Cruelty of Christie's "Fairness Formula"
I'm working on an analysis of the "Fairness Formula" -- Chris Christie's regressive school funding scheme -- and will have it ready shortly. Until then, read my piece at NJ Spotlight on this awful plan. 1) The plan will inevitably drain money from Christie's beloved charter schools, which rely on "pass-through" funding from the less-affluent local districts Christie is planning to screw over. NJ charter schools get their funds from local districts, which pass on the state aid and local tax revenue they collect based on the number of students a charter enrolls, and whether those students are at-risk (qualify for free or reduced-price lunch, a proxy measure of economic disadvantage), are Limited English Proficient, or have a special-education need. You'll often hear the NJ charter industry complain they don't get as much money per pupil as the public district schools. While it's true the law says they get 90 percent of the budgeted amount per pupil compared to the districts*, and while adjustment aid plays a role in some districts, the main reason for the disparity is that charters, on average, enroll fewer at-risk, LEP, and special education students compared to their host districts. The state's law says districts -- and charters -- get more money for these students, a policy based on reams of research. If you don't enroll them, you don't get the funds. It's that simple. 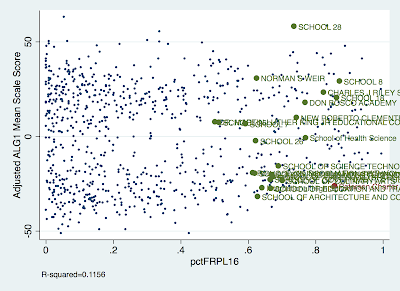 These charters are disproportionately concentrated in the districts that will suffer most under the "Fairness Formula": the "A" and "B" districts as designated by the state's District Factor Group (DFG) classification system. Which means that even though they enroll fewer at-risk students proportionally compared to their hosts, they still enroll many more than the 'burbs. OK -- then that means the charter students only get $6,599 each, right? Sorry, but it is impossible to reconcile these two statements. You can't claim the moral high ground in demanding that all children should get the same funding, then turn around and in the same breath add: "But not these children." Increased per pupil charter funding either has to come either from local property taxes or from state aid. In either case, Christie would be drawing funds from one group of children to pay more to another. He's trying to have it both ways. No one should let him get away with this. As I will show in a bit, New Jersey's most underprivileged students have, in fact, made substantial gains during the period of school funding reform. But look at the bolded part of the statement: Christie agrees that property-wealthy school districts should pay more in taxes. Christie’s argument that every student should get the exact same state resources may seem like common sense, but in fact it would strongly favor students from wealthier, mostly white communities. More affluent areas are better able to raise money for schools because their high income and property values creates a much larger local tax base. Equal state funding on top of unequal local funding leads to inequity overall. I don't much care for the undertone of Petrilli's metaphor (equating urban districts to gambling addicts is a form of dog-whistling, intentional or not). But he and Hanushek are correct in pointing out that when you shift more of the burden for funding schools on to regressive property taxes, you're going to wind up lowering the effective tax rates in wealthy districts while jacking up rates in property-poor districts. Again, Christie can't have it both ways: you can't be for flat, let alone progressive, taxation and base a larger portion of school revenues on regressive property taxes while keeping state aid flat. As I said in my last post, Chris Christie has a nasty habit of slapping together education policies whenever he needs a political boost. The illogic of the "Fairness Formula" is clearly the product of haste. Its self-contradictions betray Christie's complete lack of seriousness. ADDING: Paul Mulshine, columnist for the Star-Ledger, has been a primary driver in the media of this cruel and foolish scheme. I can't claim to have read everything Mulshine's written on this (I have a pretty strong stomach, but even I have my limits), but his m.o. appears to be throwing out a-contextual anecdotes about things like pre-K truant officers in Elizabeth to make the case that state funding can be slashed in the cities without bringing harm to students or causing local urban property taxes to skyrocket. Yes, please, keep your kid in New Jersey's high-performing schools, taking advantage of their rich resourcing and historical (if inconsistent) commitment to funding equity. Then, after they get great educations... get the hell out! This cynicism is the product of decades where the likes of Paul Mulshine are given space in the press and our national discourse while the left is told to get stuffed. As Atrios has said: the only acceptable arguments in America are between New Republic and Free Republic. Far-right Randians like Mulshine get access to the op-ed pages of New Jersey's largest newspaper, "balanced" by anti-union neo-liberals like Tom Moran, who champion "market-based" reforms while ignoring all the evidence against them. In this world, education isn't a public good or a universal right; it's a commodity to be purchased, like everything else. Appeals to the collective good are actually considered unpatriotic; the only virtue in Mulshine's America is self-interest. The less enlightened, the better. * The ostensible reason for the 90 percent is that even the architects of NJ's charter funding law understood that public school districts have responsibilities that charters do not, and it would be unfair to give charters equivalent funds if they aren't doing equivalent jobs. Transportation, for example, is the responsibility of the districts; why should charters be paid for providing busing if they don't actually provide it? Whether the 90 percent rule adequately addresses this difference is an open question. I think there's good reason to believe it's not an adequate equalizer. 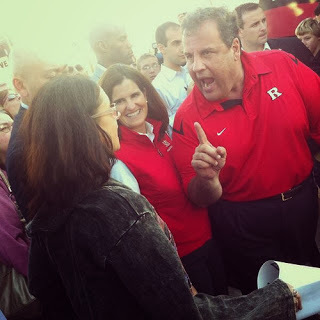 I have a piece over at NJ Spotlight about Chris Christie's insane school funding proposal. If there is an upside to this madness, it's that we just might finally have a serious discussion about how education funding really works in this state. Obviously, I'm going to have a lot more to say about this, so stand by. But before I do, I want to remind everyone of one immutable truth: Chris Christie has never been serious abut education policy. If you doubt me, just look at the very first piece of propaganda he's put out in support of his "Fairness Formula." Governor Christie: Aiden how you doing man? You’ve been hanging in there during all this, is it all right? What are you doing over the summer? Aiden Carlisle: Summer baseball and summer soccer. Why wasn't the governor telling young Aiden here that he wants him back in the classroom instead of playing baseball and soccer? Why wan't he trying to make the case to Aiden's parents that their son needs to spend his summer in the classroom to "stay competitive"? The answer, of course, is that Chris Christie was never serious about lengthening the school year -- it was all a diversion from Bridgegate**. Christie never had a plan to pay for a longer year, never had a plan to upgrade all schools so they all had air-conditioning, and never even asked whether this was something New Jersey families actually wanted. It was all a cheap political ploy. Paul Carlisle: That’s the deal. What’s the deal? Tell him what the deal is. Aiden Carlisle: School first and then sports. Like I said: if Christie's insane "Fairness Formula" leads to a meaningful conversation about school funding in New Jersey, that's great. But let's not pretend for one minute that Christie has put forward a serious policy: he's never been serious about education. He is nothing more than a political opportunist, cynically chucking out incoherent and destructive policies to his political base like so much rancid red meat. Stop pointing out my incoherence and hypocrisy! Christie's point is quite clear here: greedy, overpaid teachers were keeping kids from playing sports. 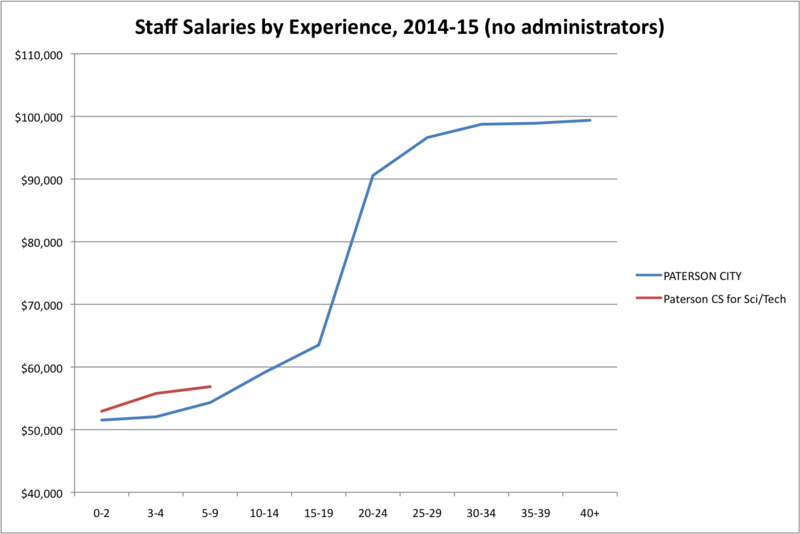 Of course, the idea of overpaid teachers is a myth, and Christie had just refused to renew the millionaire's tax. But, hey, why pass up a chance at getting a few more cheap shots in at teachers, amiright? Like Daniels, Christie never offered proof. 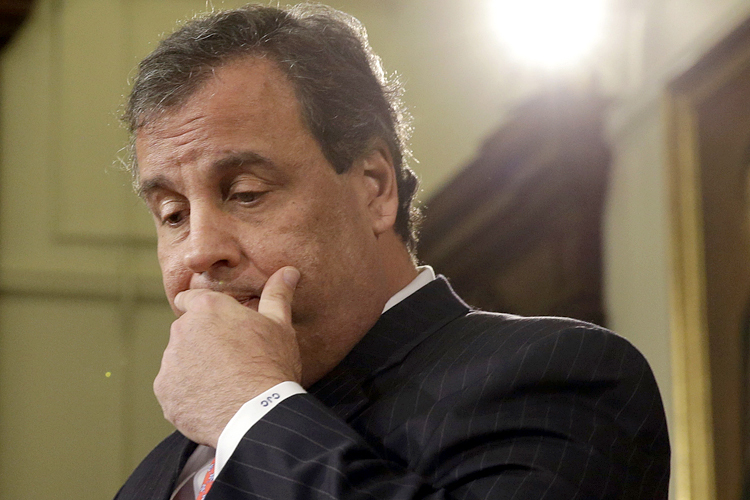 Like Daniels, Christie blew everything out of proportion. And, like Daniels, Christie has abused his office for personal uses. 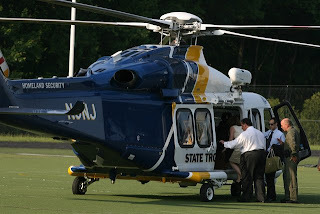 My personal favorite was when he got the state police to fly him in a helicopter to his son's private school to watch him play a baseball game, then ducked out early to meet with GOP bigwigs from Iowa. Tell those damn teachers to get back to work! That particular incident got a good bit of play in the press. What barely got mentioned, however, was that Christie also used those same helicopter privileges to fly to a state-funded "town hall" meeting in Nutley, where he proceeded to say New Jersey's teachers were "lying" to their students. 2018 can't come fast enough. ** To be clear: Christie made noise about extending the school day and year before Bridgegate. But he brought it up again, after having stopped talking about the idea for a while, in his 2014 State of the State address in a clear attempt to divert attention from the scandal. The opt-out scolds -- those who spend their days tut-tutting at parents who've decided to take their children out of high-stakes standardized tests -- having been warning over and over that there will be serious financial consequences for schools that do not have high test participation rates. Could they actually be right? BROOKLYN — The state has penalized 16 high-performing city schools — potentially costing them each up to $75,000 in grant money — because of their exam opt-out rates, DNAinfo New York has learned. These schools were on track to win recognition from the state as “Reward Schools" — an annual honor that makes schools eligible to apply for grants — but were not included in the list because they failed to meet a 95 percent participation rate on the exams, state education officials confirmed. “While U.S. Department of Education [USDE] guidelines allow states to impose sanctions on districts specifically for failure to meet participation requirements [of the tests], including the withholding of state funds, New York State has not taken such action against any district or school,” State Education Department spokeswoman Jeanne Beattie said. The city’s Department of Education declined to comment on schools losing the Reward designation, but noted that schools were informed of the state’s criteria in a DOE FAQ, updated in March. “Regardless of the reason (i.e., absence or refusal), if fewer than 95 percent of a school’s students or one or more of its subgroups of students (e.g., less than 95 percent of black students, students with disabilities, etc.) take the math or ELA assessments, the school is designated having failed to make “Adequate Yearly Progress” for that school year,” the FAQ noted. If these grants only go to "Reward" schools, what does it take to get "rewarded"? Focus Districts have schools with low academic performance on the Grades 3-8 ELA and Math Tests or low graduation rates for certain groups of students, such as those who are economically disadvantaged, students with disabilities, and English language learners. The performance of these schools is not improving. Focus Schools are schools within Focus Districts that have low academic performance that is not improving. Priority Schools are schools with the overall lowest student academic performance on state assessments and persistently low graduation rates. Bad as all that is, the two columns furthest to the right make the situation even more awful. Incredibly, the schools New York State punishes have many more students proportionally who have a learning disability (SWD) than the schools the state rewards. And "Focus" and "Priority" schools are far more likely to have large proportions of students who are in economic disadvantage. Am I the only one thinks it's insane to make special grants, even if they are small, available to schools that serve fewer students of color, fewer students with special needs, fewer students who speak a language besides English at home, and fewer students who are in economic disadvantage? New York State already engages in all sorts of stealth inequities when it comes to funding its schools, as this report by Bruce Baker notes. * A few $75K grants are small change compared to the literally billions have that have been denied to New York's neediest school districts. Still, it's amazing that a grant program like this, which rewards schools enrolling the least needy students, exists. Just once, I'd like the opt-out scolds to acknowledge some of this. Just once, I'd like them to point out how illogical it is for politicians to simultaneously demand that schools meet new high standards while refusing to provide the money their own laws say is necessary to properly fund education systems. Just once, I'd like them to stop worrying so much about students who opt-out of tests, and start worrying about politicians who opt-out of funding the schools that enroll the neediest students. But that doesn't tell the story the opt-out scolds' patrons want to tell, does it? My new favorite cartoon. via Jeff Parker. *As always, Bruce is my advisor at Rutgers GSE. 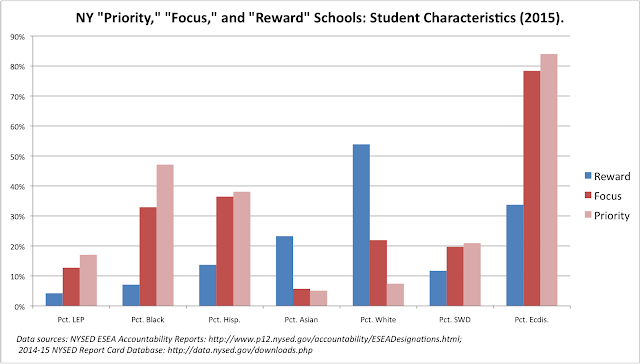 He also diid a similar analysis of New Jersey's "Priority," "Focus," and "Reward" schools back in 2012. I know Moskowitz doesn't think the rules should apply to her because her schools are so awesome. But what made her think she was going to get her money if she didn't follow regulations? If she thought the terms of the contract were so unreasonable, why did she apply in the first place? Two years ago, New York State passed a law giving charter schools the right to operate pre-Ks. The law provided that with respect to oversight, “all such monitoring, programmatic review and operational requirements . . . shall be the responsibility of the charter [authorizer].” Thus, a charter’s pre-K program would be regulated and overseen just like its other grades. I'm not a lawyer, but this is awfully clear: Success Academies didn't have to apply along with the NYCDOE. They could have gone it alone, but chose not to. So NYC, as the lead applicant in a consolidated application, has every right to demand the other organizations that sign up play by their rules. If the other organizations don't want to go along, fine -- submit your own application. But don't whine afterward that you don't like your school district's conditions when you could have submitted your own application. and other program requirements are being met and that such public funds are being spent in accordance with the requirements of Education Law §3602-ee, the Department’s RFP and DOE’s RFP. Again: if Moskowitz didn't like the terms of this deal, she was free to strike out on her own. If she doesn't like the predicament she's in, she has no one to blame but herself. One more thing: Moskowitz claims that the monitoring of her Pre-K program should have been left to her authorizer, the State University of New York. Had she applied on her own, however, NYSED would have been well within their rights to ask whether or not SUNY actually has the capacity to properly monitor the program. You might not like NYCDOE for all sorts of reasons, but at least it has an infrastructure in place to monitor Pre-K programs; I very much doubt SUNY has anything equivalent (given what's been going on inside Success Academy lately, I think I'm justified in having my doubts). New York City, however, has insisted that charter schools agree to a 241-page contract that regulates every aspect of their programs: their curriculum, field trips, professional development, scheduling, discipline, playtime and use of technology. For example, it prohibits more than three field trips per year involving transportation; dictates the precise amount of playtime that must be allowed (2 hours and 7 minutes); and prohibits the use of a SmartBoard (an interactive screen that is essentially a modern blackboard) for more than a 30 minutes a week. As Elia notes in her decision, however, every one of these restrictions is both reasonable and in accordance with the guidelines set out by NYSED's Division of Early Childhood Education. In other words: had Success struck out on its own, it probably would have had to adhere to guidelines quite similar to these. The city has limited school resources; it's reasonable for them to put a cap on field trips that use transportation. We know that high-quality Pre-K should include significant amounts of playtime; it's reasonable for the city to set a lower limit. We know we should limit the time young children spend in front of screens; it's reasonable to set a limit on it, SmartBoard or otherwise. Moreover, petitioners’ argument ignores the fact that a charter school’s participation in the SUFDPK program is voluntary. As petitioners would have it, a charter school could voluntarily apply for a grant of State funds but assert an exemption from all grant requirements based on Article 56 and still be entitled to such State funds. The Legislature could not have intended such a result, which is both irrational and contrary to public policy. However, there is an important principle at stake. Not only is the city violating the pre-K law, the whole idea of charter schools is that they should be freed from the control of the district bureaucracy. If all pre-K programs, including those run by charter schools, have to subject themselves to the rules and requirements imposed by the city, then we are back to an educational monopoly. The city says its requirements are reasonable. That’s debatable, but it’s beside the point. If the Obama administration were to seek the power to regulate the content of this newspaper, the issue wouldn’t be whether or not the regulations were reasonable, but whether the government ought to regulate the free press. In our case, while we are subject to regulation, it is regulation by a different government entity to ensure that the city doesn’t have an educational monopoly. The city also says it has to be able to assure that the pre-K program Success offers is of high quality. However, that is the responsibility of our authorizer, the State University of New York. Moreover, being subject to the city’s control will diminish the quality of our program, not enhance it. Success’ students pass state tests at more than two times the rate of the district schools and more than three times the rate of the district schools in the poor neighborhoods we primarily serve. This is a ridiculous argument -- on multiple levels. First, passing noisy, questionably valid assessments doesn't automatically give you carte blanche to ignore basic rules of transparency and accountability. The taxpayers of New York have every right to expect that organizations receiving public funds follow the rules laid out by their duly elected representatives. Next, given everything we've learned this past year about how Success actually operates, it takes a special kind of smug for Moskowitz to claim superiority over the public district schools. 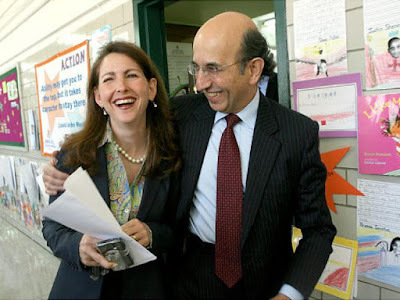 Finally: has Moskowitz never heard of the First Amendment? Her comparison of the government regulating the content of a newspaper to insisting a public contractor sign a contract is so dumb that only an outlet as bad as the Daily News would put it into print. This is actually really simple: New York City has clearly laid out regulations regarding Pre-K programs. Maybe you don't like them; fine, challenge them however you want. But you don't get to take public monies and then decide, after the fact, that you don't want to play by the rules. 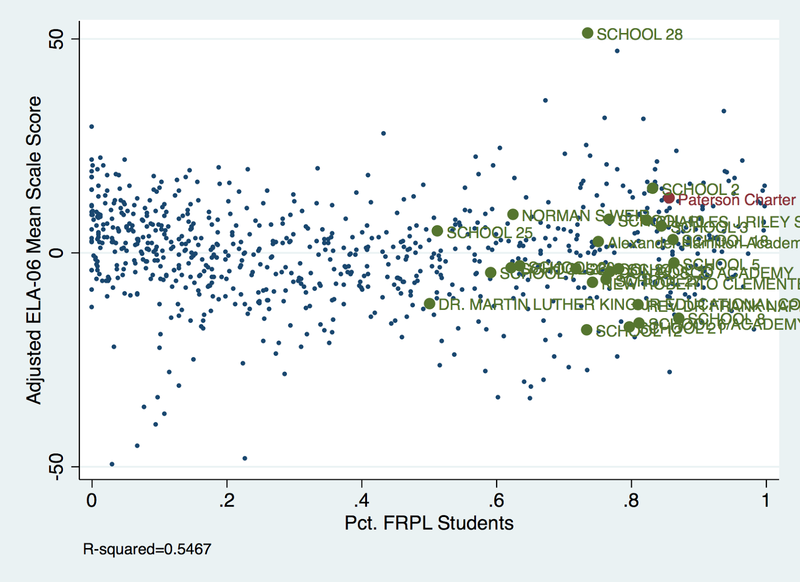 I wish I could say that Moskowitz is an outlier -- but she's not. The charter sector, despite its many, many, many, many, many failings, has done a terrible job of policing itself. I have no doubt there are many decent, sincere educators operating charter schools -- but they have been largely silent on calling out bad actors within the sector, or addressing the structural deficiencies that encourage bad behavior. You might say: He was referring to your position about pre-K, which seems inflexible. Every other charter school apparently signed an agreement to follow city rules, why do you think you’re above doing that? We have fought for 10 years to build schools free from any influence that might dilute or compromise our program for our students. Our independence from district oversight is inextricable from that program. Why? So you can use a SmartBoard more? So you can have the kids play less? Or, as Elia's decision suggests, might there be another reason? In response to petitioners’ complaint regarding Article 5(b)(2) of DOE’s proposed contract, which limits SUFDPK providers’ authority to “reject, suspend, expel or otherwise refuse to provide any or all of the Services to any eligible child,” DOE explains that it has a “strong interest in ensuring that disciplinary measures in the consolidated UPK program are age and developmentally appropriate and that 4 year-olds receiving services within the consolidated UPK program are not subject to suspensions or expulsions.” DOE has articulated a rationale for its requirement that is based in sound educational policy and is not inconsistent with Education Law §3602-ee. While petitioners have included such provision in their “non- exhaustive” list, they have articulated no rationale as to how such provision violates either Article 56 or Education Law §3602-ee. We have extensive documentation of Success Academy's disciplinary practices, including suspensions for very young children. We know how Moskowitz feels about NYC's attempts to remake its disciplinary codes. Is this the "influence" she and Brown are worried about? That the city might stop Success from imposing its "no excuses" philosophy on 3-year-olds? If that's the case, it's probably better for everyone if Moskowitz just stays out of Pre-K. ADDING: More from Peter Greene. Who's Responsible For Misusing Washington DC's Test Scores? Recently, Matthew Chingos and Kristin Blagg of the Urban Institute published a blog post about the rise in national test scores for schools in Washington, DC. The post has been republished elsewhere and, consequently, cited frequently in the edu-bloggosphere and press. I have four specific objections to their post, which I'll lay out below (from least to most technical). But let me start by saying I don't think Chingos or Blagg are hacks; far from it. I want to engage on what they wrote because I think it's important and I think they are serious. My tweeting yesterday could easily be interpreted as my saying otherwise, and for that, I apologize. We now live in an atmosphere where, far too often, education research is being willfully misrepresented by people with ideological, personal, or other agendas. As I've said many times here, I don't pretend that I don't have a point of view. But I also work hard to keep the evidence I cite in proper context. Student performance in DC has "increased so dramatically." The two factors that influence test scores are gentrification -- in other words, changes in the demographic composition of DC's student body -- and improvements in school quality. The fact is, as I show below, there is at least one other factor that has contributed significantly to changes in DC test scores, and there are almost certainly others as well. We are now three paragraphs in and the authors have repeatedly set up a particular research framework: changes in the NAEP are due either to changes in student demographics or improving quality in schools. Now, as I said above, Chingos and Blagg are not hacks. Which is why they admirably explain, in detail, why they did not include the most important student demographic factor affecting test scores -- socio-economic status -- in their analysis. Go ahead and read the entire post; you'll find that "if any" clause is the only time they suggest there may be other factors influencing DC's NAEP scores besides student characteristics and school quality. We'll save the claims about Rhee's innumerate teacher evaluation system for another day. Does it look like "if any" was enough to stop Chait from making a way overblown claim about Rhee's policies being the driver of DC's test score rise? Read the whole thing: does it seem to you that Chait is willing to entertain any other possibilities for DC's "dramatic" rise in NAEP scores? And are you at all surprised he used Blagg and Chingos's post the way he did, given how they wrote it? (0:20) Well, over the last decade really, the scores in DC have outpaced the rest of the nation. In fact, over the last few years, the gains that DC kids have seen have actually led the nation. Rhee, however, is also not willing to acknowledge that DC's gains might be due to factors other than student characteristics or policy changes. (2:43) And then people said, well it was because of shifts in demographics; you know, basically meaning more white kids are coming in. And this most recent study last week showed that was not the case either. And so it's high time people realized, no, actually, poor and minority kids can learn if they have great teachers in front of them every single day and if families have school choice and are allowed to choose the programs that are serving their kids best. If you put those dynamics in place, wow, kids can actually learn. You'll notice how Rhee conflates "poor" and "minority" students, even though Blagg and Chingos did not address socio-economic status directly in their analysis. * Nowhere in this interview, however, does Rhee acknowledge there may be others factors involved in the rise of DC's NAEP scores. Let me be clear here: Blagg and Chingos did not put words into Rhee's mouth or Chait's blog. But they know know how the debate is being conducted now; they know folks like Rhee and Chait are out there waiting to pounce on this stuff. Why, then, frame your conclusions this way? Why limit your cautions to a mere "if any" when you know for certain someone is going to take your stuff and use it for their own ends? At some point, you have to own at least some of the consequences of putting your research into the public sphere in a particular way. At the very least, you need to point out when it's being abused. Will Blagg and Chingos do that? I hope so. This next part is more technical. Skip down if you're not interested. We decided to compare DC's score gains during that period to those recorded in other big cities. Our decision to run this simple check required almost no IQ points. Duh. 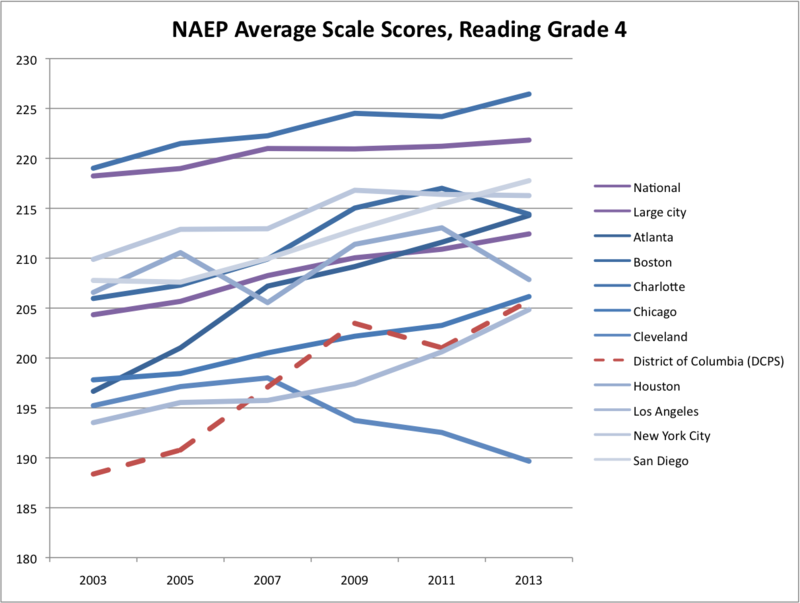 As everyone knows except New York Times readers, NAEP scores were rising all over the country during the years in question. To simplify the demographic confusion, we looked at how DC's black kids did during that period, as compared to their peers in other cities. For all NAEP data, start here. Let me take this a bit further. 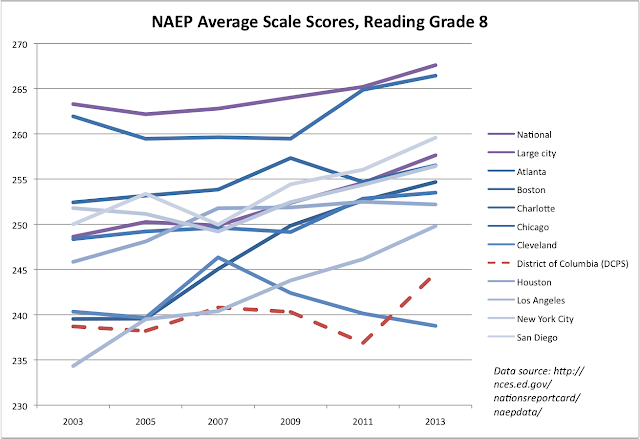 Here are some quick and dirty graphs using NAEP scores as taken from the Trial Urban District Assessment (TUDA), and the national NAEP. Understand, we have to approach these with great caution: I haven't done anything to adjust for student characteristics or a myriad of other factors that influence test scores. But this is good enough to make a larger point. 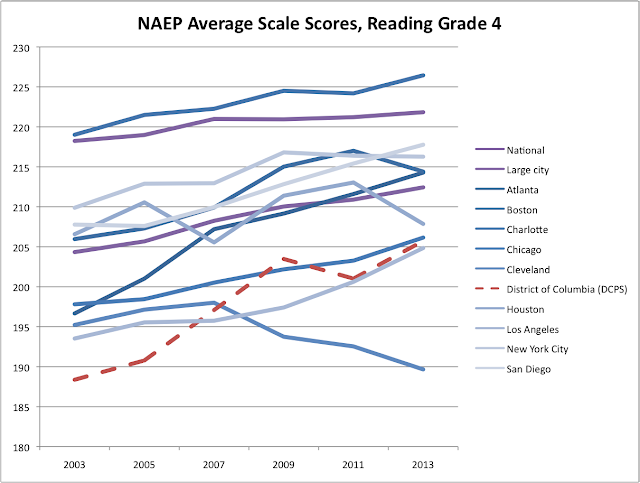 Here are the average scale scores for all students on the Grade 4 Reading NAEP test. No question, DC's score rose -- but so did the scores of many other cities. Even the nation as a whole rose a bit during the time from 2003 to 2013. 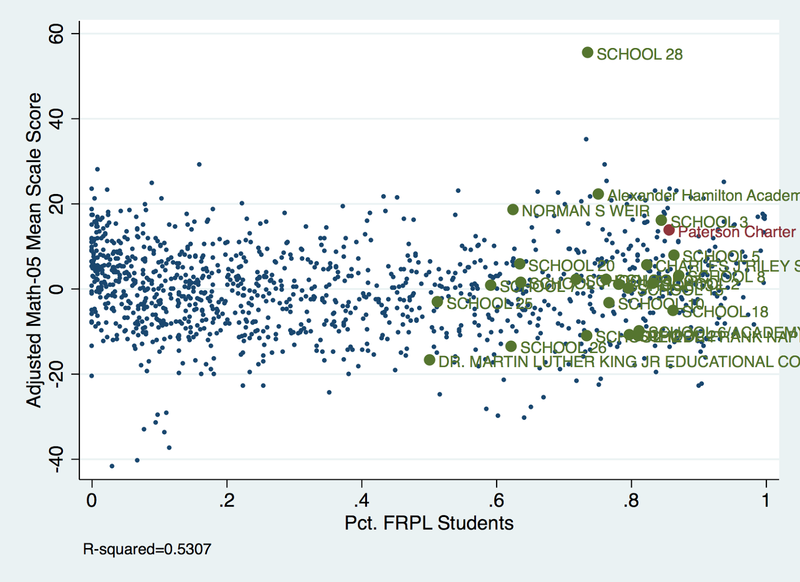 How well did DC's eighth-graders score in math in 2013, at the end of Rhee's reign? As Rhee points out, DC scores did rise more relative to many other cities. But gains at the low part of the score distribution are not necessarily equivalent to gains at the high part. It may well be easier to get gains when you're at the bottom, if only because you have nowhere to go but up. Atlanta, Cleveland, and DC started in 2003 at close to the same place. Cleveland finished below DC, but Atlanta finished above. Los Angeles, meanwhile, which was below all three, rocketed above DC. 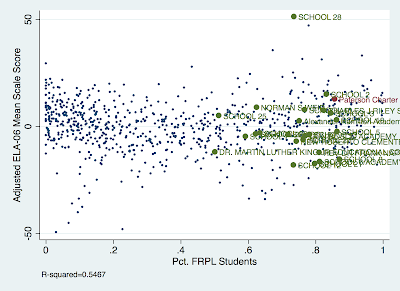 Does this tell us anything about policy changes and their effects on student outcomes? Can we confidently say LA rocks? Absolutely not; we didn't adjust for any student demographic changes or other factors -- but even if we did, we couldn't be sure what was causing the changes. The point here, however, is that even with these crude, unadjusted measures, there is far more to the story than simply stating that DC has "dramatic" and "sizable" gains. And the gains of high-flyers like Boston and Charlotte can't be equated with the gains of cities on the lower part of the scale. Again: I didn't see any cautions in Blagg and Chingos's work about this. We performed adjustments by estimating regression coefficients using the student-level data from 2003, roughly halfway between the available periods for mathematics (1996–2013) and reading (1998– 2013). Specifically, we regress the test score of each student in 2003 on the set of control variables described above.1 Control variables are included in the regression using dummy variables identifying each of the groups of students for each construct, with the exception of the one arbitrarily chosen group that is the omitted category (except for age, which is included as a continuous variable). So here's the thing: this method is based on an assumption that the effects of student characteristics on test scores remain fixed across time. In other words: the effect of a student qualifying for free lunch (a proxy measure of SES) in 2003 is assumed to be the same for every test administration between 1996 and 2013. But we don't know if that's true. If, for example, there is a peer effect that comes from changing cohort demographics over time, there may be a change in how a student's characteristics affect their test scores, even if the characteristics themselves don't change between individuals at different points in time. Now, there's actually something a researcher can do about this, and Blagg and Chingos likely have the data they need. Rather than just regressing one cross section of test scores on student demographics, regress all the years you're studying but add year dummy variables and interactions with the demographic measures and years. That way, you'll see whether the effects of student characteristics change over time, and you'll get a better comparison between years. In many cases you couldn't do this, because each interaction adds a covariate, which costs you another degree of freedom in your regression. 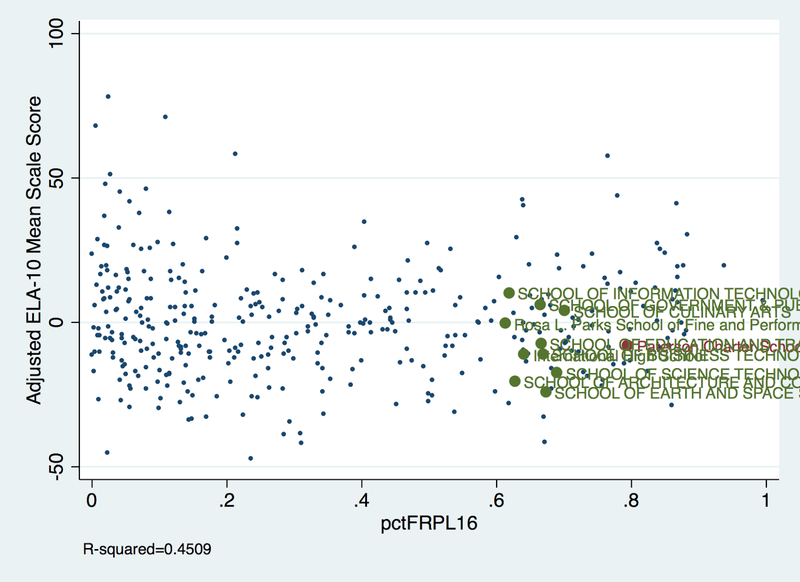 But Blagg and Chingos are working with microdata, so their n is going to be very high. Adding those interactions shouldn't be a problem. Of course, it's quite possible doing all this won't change much. And you'd still have the problem of equating different parts of the scale. But I think this is a more defensible technique; of course, given that we're really in the weeds here, I'm open to disagreement. Look, I don't want to equate my methodological qualms about Blagg and Chingos's post with the outright abuse perpetrated by Chait and Rhee. But I'm also not about to let Blagg and Chingos off the hook entirely for what Chait and Rhee did. 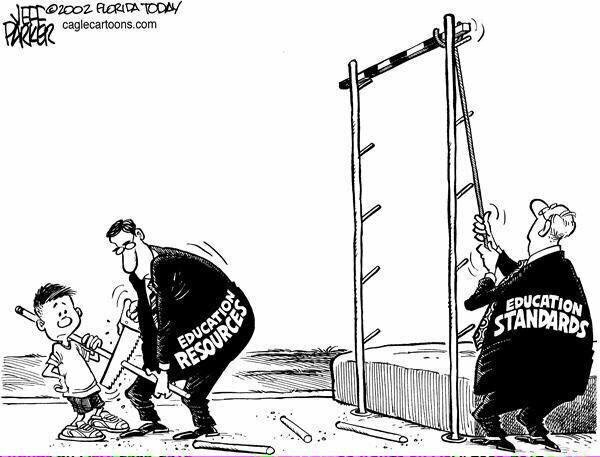 The sad truth is that the willing misapplication of education research has become a defining feature of our current debate about school policy. Is my "side" guilty of this misconduct? Sure; there's stuff out there that supports my point of view that I don't think is rigorous enough to be cited. Of course, my "side" hardly has the infrastructure of the "reformers" for producing and promoting research of questionable value in service of a particular agenda. Still, that doesn't excuse it, and I'll take a deserved hit for not doing more to call it out. But it would be nice to be joined by folks from the other "side" who feel the same way. Let me say something else about all this: there's actually little doubt in my mind that Rhee's policies did increase test scores. How could they not? Rhee had her staff focused on test score gains pretty much to the exclusion of everything else. It's not far-fetched to imagine that concentrating on local test-taking carried over and affected outcomes on the NAEP. But Rhee's obsession with scores trumped any obligation she may have had to create an atmosphere of collegiality and collaboration; that's borne out by the resounding rejection of Mayor Adrian Fenty, whose reelection was largely a referendum on Rhee. And that, perhaps, is the biggest problem with Blagg and Chingos's analysis -- our, more accurately, the entire test-based debate about education policy. I'm not saying test scores don't count for something... but they surely don't count for everything. Was it worth breaking the DC teachers union and destroying teacher morale just to get a few more points on the NAEP? Is anyone really prepared to make that argument? One more thing: I was at a panel at the American Educational Research Association's annual conference this past spring about Washington DC's schools. The National Research Council presented a report on the state of a project to create a rigorous evaluation system for DC's schools. The District was making progress in collecting education data and making it publicly available during the time of this evaluation, but the city does not have a fully operational, comprehensive infrastructure for data that meets PERAA’s goals or its own needs as a state for purposes of education. To meet these needs, the report says D.C. should have a single online “data warehouse” accessible to educators, researchers, and the public that provides data about learning conditions and academic outcomes in both DCPS and charter schools. Such a warehouse would allow users to examine trends over time, aggregate data about students and student groups, and coordinate data collection and analysis across agencies (education, justice, and human services). When you live in a data hole, this is what you get: incomplete research, easily subject to abuse. When we get down to it, we must admit that we know next to nothing about whether any of the educational experiments foisted on the children of Washington DC have done anything to help them. Given this reality, I would respectfully suggest to anyone who wades into an analysis of Washington DC's schools that they stop and think very carefully about the implications of their research before publishing it. In the absence of good data and rigorous analysis, what you put out there matters even more than it would in places where the data are more comprehensive. 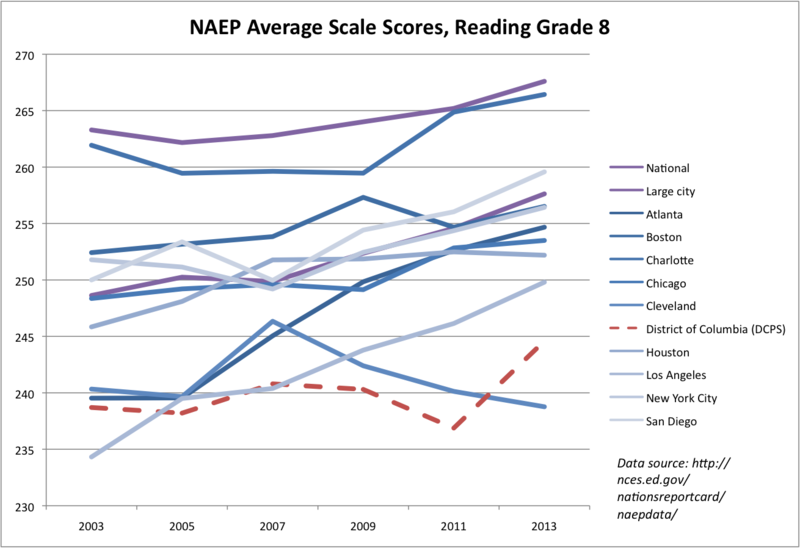 ADDING: It's important to point out, as Bruce Baker does here, that the NAEP gains in DC largely pre-date Rhee-form. * They did use parent education as a proxy measure of SES in their Grade 8 analyses. But that measure is a self-reported, very rough categorical measure that breaks down parental education into: didn't finish high school, finished high school, had some education after high school, finished college. You go with the data you've got, but this measure is obviously quite crude. ** I first came across the term in Murnane and Willett's Methods Matter, which I highly recommend to anyone interested in quantitative methods in the social sciences. *** No, DC is not a state. But it does have a population larger than Vermont and Wyoming. **** To be fair, his opinion wasn't shared by everyone on the panel. Michael Feuer of GWU stated that he thought data collection and analysis had improved, even if it wasn't where it needed to be.